Constructed from 1909 to 1912, the Church of St. Agnes is the third church built on this site since 1887, when Archbishop John Ireland founded the parish for German-speaking immigrants seeking employment with the Great Northern Railway. 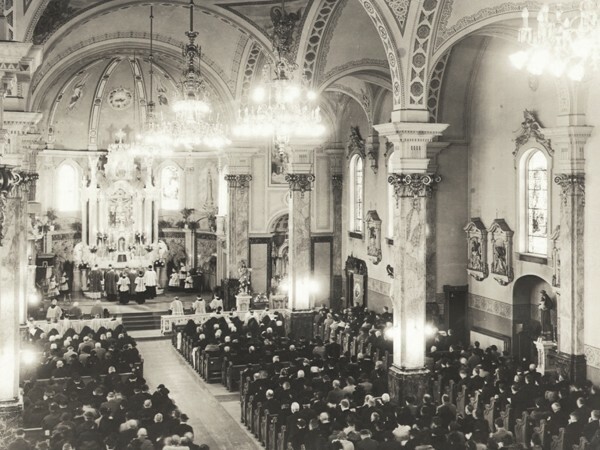 Immigrants who came to Saint Paul, MN from the old Austro-Hungarian Empire and southern Germany flocked to the familiar Baroque style church. 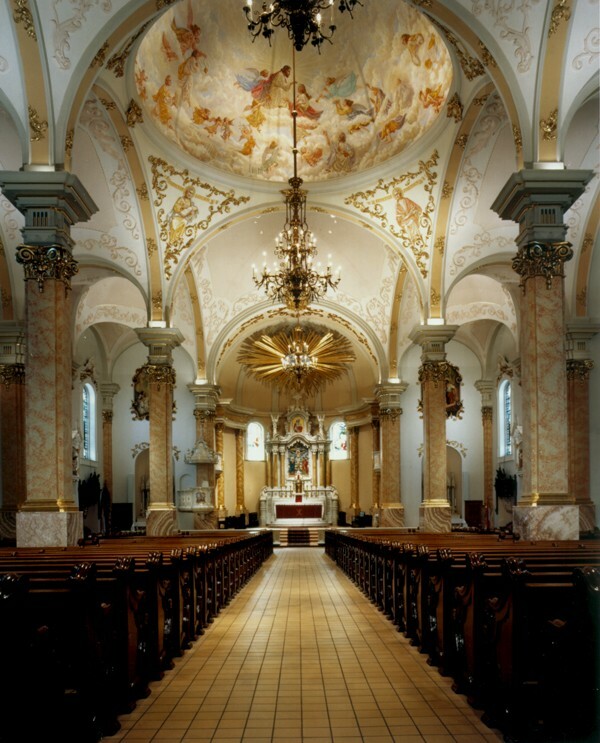 Architect, George Ries modeled the Indiana limestone abbey church after a monastery in Upper Austria. Its four bell tower, standing just over 205 feet, remains a skyline landmark and beacon for worship. The inscription, Porta Coelí, invites the visitor to enter heaven. On entering the church, one’s eyes are carried upwards to the dome and its mural rising sixty feet above the floor. 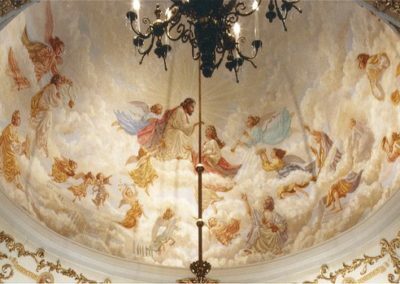 Father Richard Fale of Wisconsin painted the Apotheosis of St. Agnes mural portraying Christ receiving the martyr, St. Agnes of Rome into Heaven. 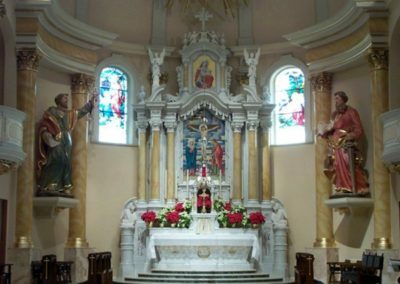 She is surrounded by many angels and martyrs bearing lilies to symbolize purity, the martyr’s palm of victory, and a trumpet signifying triumphant entry into Heaven. One angel offers a laurel wreath, another offers the Book of Gospels, the inspiration for St. Agnes’ heroic life. 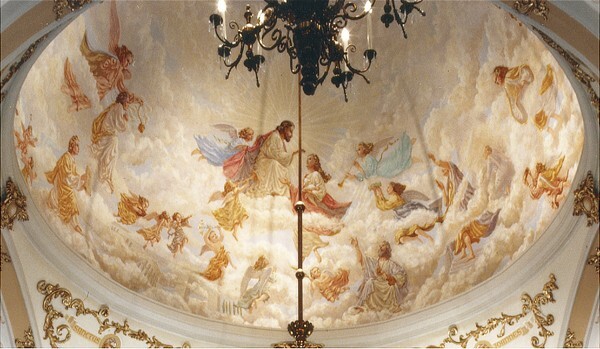 The mural conservation by The Conrad Schmitt Studios was part of the extensive building renovation. 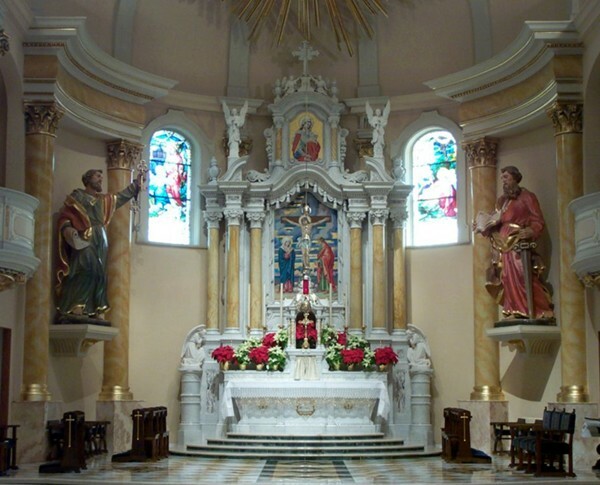 CSS artists cast and installed two large cherubs, stationed on either side of the altar. Ornate stenciling, gilding, and decorative plaster adorn the inspired decorative scheme. 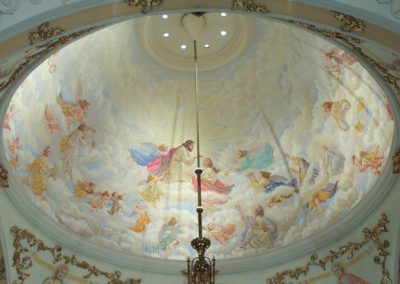 The renovation included a modern sculptural interpretation of the baldachin, featuring a painting of the Holy Spirit. Listed on the National Register of Historic Buildings, the Church of St. Agnes continues to inspire profound devotion.